Architects tend to favour form over function because they know function changes over time. They know that a building’s occupants and owners will change, and over the years, the building will be inevitably adapted, decorated, used and even abused. That a radical design will affect the locale, and influence (or at least inform) other architectural designs elsewhere, is quite a responsibility when you think about it — it is not just about the owners or users of the building, but the fact that it is seen by so many people in all weathers and in every season and that it takes on certain mythical traits. This sort of thing starts with the tradesmen who take ownership and possession of the building (“That’s one of my jobs”), and goes on through to the future historian who declares it’s significance. A landmark building is definitely identified with a place, with a nation, and with the people. Think of the Leaning Tower of Pisa, The Eiffel Tower, The Pyramids, Sydney Opera House, The Forth Rail Bridge and so forth. These are more than merely functional, and more than just fancy either; they are steeped in cultural identity — and as a result can be called iconic. 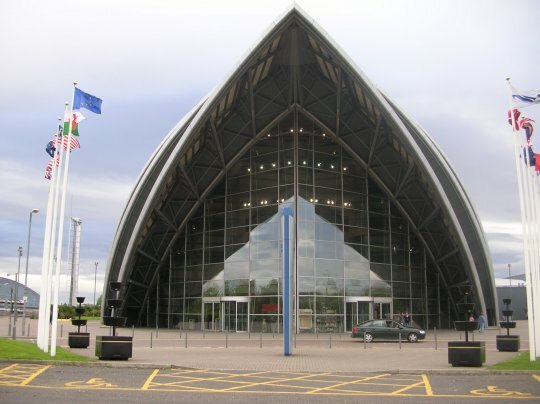 The city of Glasgow was awarded The European City of Architecture and Design 1999, as a marking of the city’s unrivalled influence on the architecture and town planning throughout the western world as the second city of The British Empire. However, the landmark building that represented the city’s architectural tradition throughout this year of recognition was not by Macintosh, Hamilton, Adam nor Thomson. 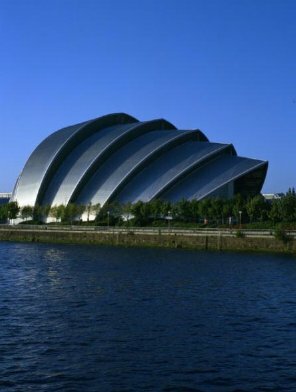 In fact, the epitome of Glasgow (and therefore, Scottish) architecture has just been completed a couple of years previously — in 1997 on the north bank of the neglected River Clyde, and although it was known officially as The Scottish Exhibition and Conference Centre’s Clyde Auditorium, it has become known as ‘The Armadillo‘. 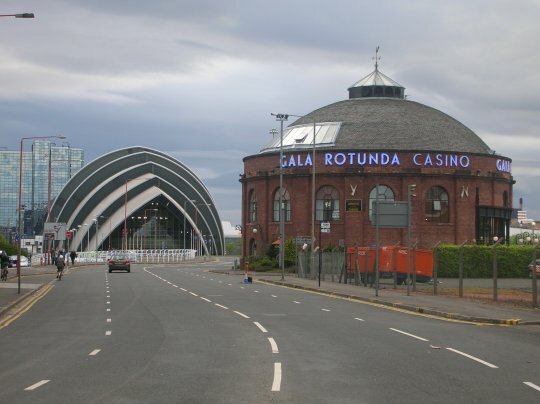 This “Armadillo” has inspired everyone, and re-invigorated and rediscovered the entire Clydeside, which has been under development ever since. This single building has radically altered perceptions of Glasgow, not just outsiders’ perceptions but also Glaswegians’ perceptions too. This one building has moved the focus of the city back to the river’s banks once more, and has effectively moved the centre and changed the flowing dynamics and investor interest. So who is responsible for this amazing building? Lord Foster of Norman Foster and Partners. So why is it shaped the way it is? 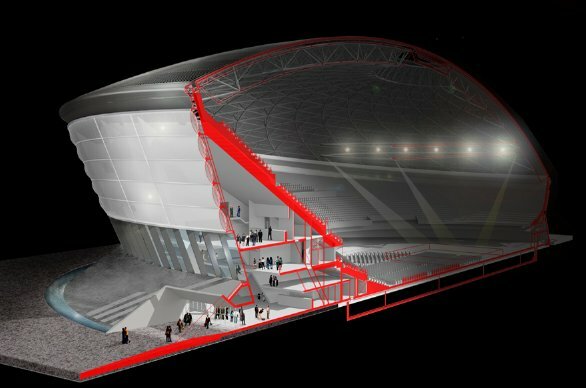 Well, like the Sydney Opera House (with which it is often compared), the initial shape is very much to do with performance acoustics. In a venue such as this, windows and natural light has to be as controlled as the acoustics inside and outside too. It rains a lot in Glasgow, but the shape of this building means that the rain washes easily down the slopes to the gulley at the foot of the building. In sunlight, the cladding expands freely. This cladding is a special wafer-thin space-age titanium alloy that doesn’t corrode. Aesthetically, the building’s façade is designed to line-up with an approach road, but is most often seen across the river, side on. The intention seems to be to constantly surprise; the building changes shape depending on the viewpoint. It is as surprising from the air, as it is close-up. It changes with the weather too, and is particularly interesting at sunset when it glows orange. 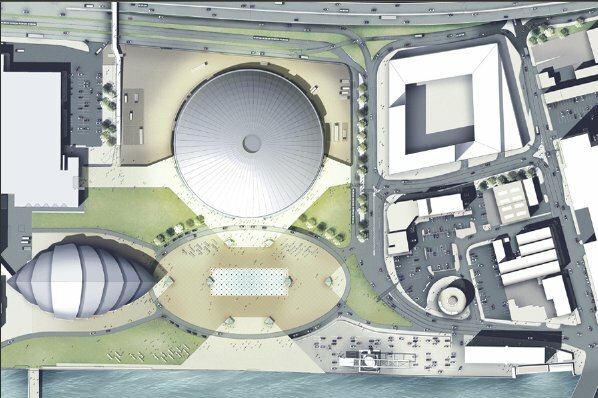 The shape is intended to evoke the ships and huge liners that were built on the Clyde, and that overhung the docks. 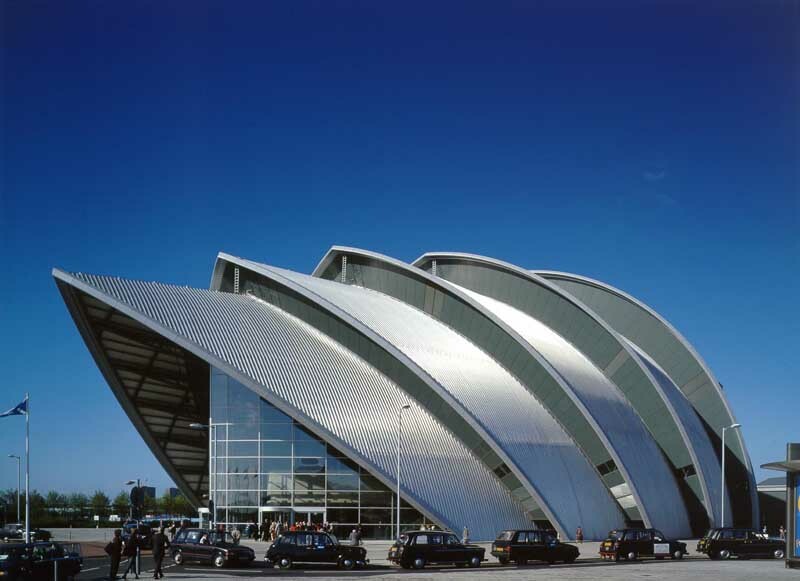 It can look like a series of upturned boats at the side of the Clyde, metallic hulls fitting inside one another. 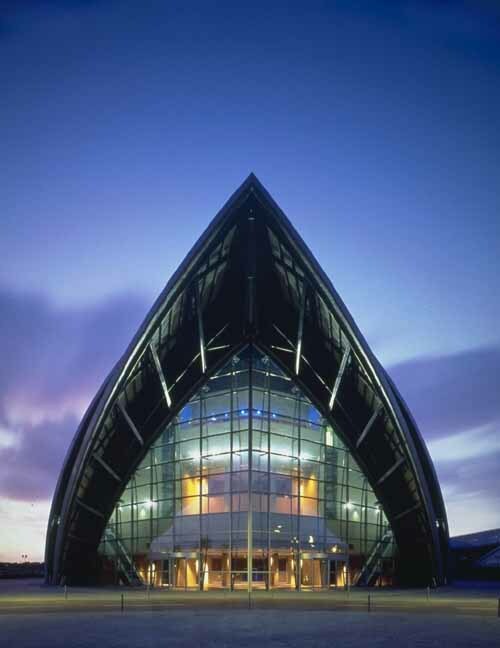 It is, after all, built on land reclaimed; they started infilling Queen’s Dock in 1983, and created, by 1985, a 64 acre site containing the SECC main building. Structurally, the design affords an unobstructed view of the stage as there are no columns due to the arched and layered construction. The overhang allows social mingling and queuing for tickets and taxis out of the wind and rain. The glazed façade bathes all levels in natural light, but at night the artificially lit interior lights up the exterior area in front. The congress spaces are used as sitting, waiting meeting areas — with bars serving drinks and areas offering easy access to the windowless 3000-seat auditorium. This remarkable building is always fun to visit, always looks good, and is the nearest thing Glasgow has to a “Leaning Tower of Pisa” or “Eiffel Tower”. You can buy tourist keyrings, postcards and T-shirts of the “Armadillo”. This building represents modern Glasgow — a far cry from the blackened Victorian tenements or 1960s skyscrapers. This entry was posted on Tuesday, April 17th, 2007 at 21:45 and is filed under Design Icons, Icons, Structures. You can follow any responses to this entry through the RSS 2.0 feed. You can skip to the end and leave a response. Pinging is currently not allowed. I think it has a Gothic arch feel at the entrance, and that it looks like a ship from the air, which is entirely appropriate. I agree that this is the most remarkable building in a city of remarkable architecture (remarkably good and bad).